Get 15% off your order when you spend $50 at this shop. Discount shown at checkout. A unique ring designed after the bands that are placed on migratory birds. 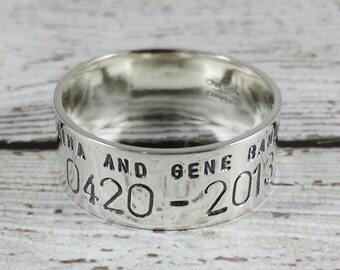 The perfect gift or wedding band for the dedicated goose and waterfowl hunter in your life. Each ring is hand crafted from thick sterling silver and designed in a 1/2" width with smooth comfortable edges. Photos shows ring with a polished finish but may also be created with a brushed matte finish. ****Please note that the date in the center is stamped in the duck band style format....xxxx-xxxx. If you do not want this style for the date, You must let me know in the notes box - Thank you"
This does not include shipping time. For additional information, please go to our shop policies page. This ring is amazing! Perfect for my husband! The ring didn’t fit at first and the shop was willing to help us get the correct size. Thank you so much. He loves it! Absolutely stunning quality rings, and the seller is very easy to work with and understanding. 10/10 would buy from Charitable Creations again! I got this earlier than the ship date, but your mileage may vary. Very pleased with my purchase & good ship time. I accept PayPal, and All major Credit Cards. If you reside in Massachusetts, you will be charged a 6.25% sales tax. Coupons and Vouchers - Only one coupon per order may be used and only one voucher per order, per customer is allowed. Coupons, discounts and vouchers may not be combined. Please be aware that you may incur a customs fee or tax for orders shipping outside the USA. This fee is the responsibility of the buyer and will vary by country. I want you to be completely satisfied with your purchase. I individually hand stamp each letter on all personalized hand stamped jewelry. Variations in spacing and alignment are part of the unique charm to your hand made piece and should not be considered a defect. However, if the error was not our mistake, and you are simply not satisfied with product or font you chose, the item is yours to keep. 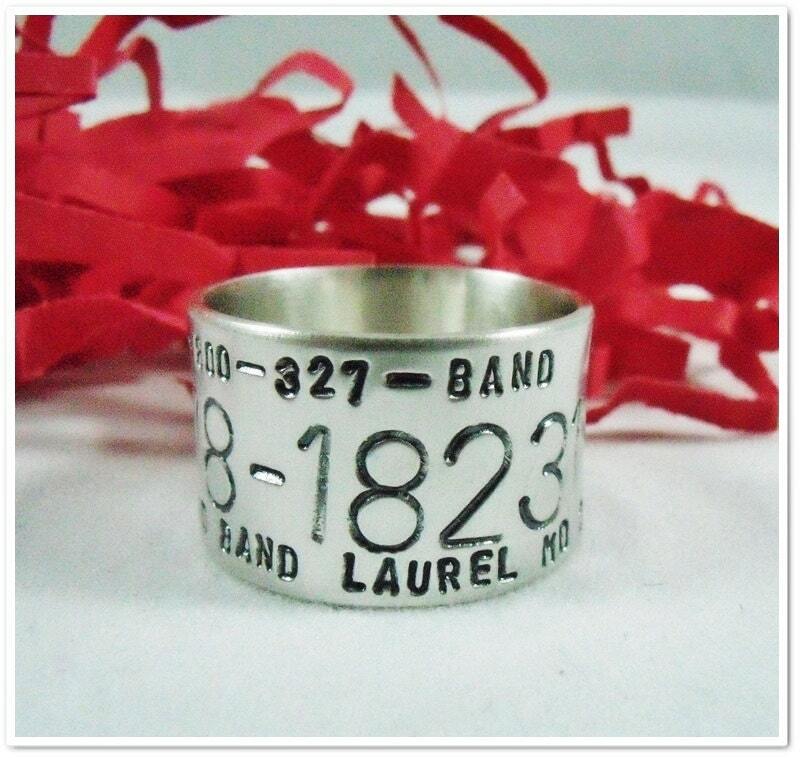 We reserve the right to judge our own quality and try our best to produce the highest quality of hand stamped jewelry. We can not remake an item without the original piece being returned. In the event that you are not satisfied, let me know within 3 days of receiving it and I will accept a return or exchange for a similar item. I will issue a refund (minus shipping) or an exchange once I have received the item back in it's original unworn condition and packaging. For Returns and Repairs, please download and print our Repair Form and include with your item for repair/return. Returns need prior authorization. For Custom Hand and Footprint jewelry - Custom print jewelry is non-refundable and non-returnable due to the personalized nature of the piece. Option 2 - We will ship you an ink-less finger print kit to use to take your prints and ship back to us. A prepaid self addresses envelope will be provided a long with a fingerprint customer form that you will need to fill out and ship along with your kit. *This option is mandatory for taking hand and footprints of infants as it is certified non toxic and used in hospitals. Once we receive your prints your new custom print jewelry will be created and shipped within 1-2 weeks. Order Cancellations - You may cancel your order within 24 hours of the purchase date. After this time all canceled orders will incur a 25% restocking fee. If your order has already shipped it can not be cancelled and regular return policies will apply. Your Satisfaction is my #1 priority! Your custom order will be created to what is written in the Personalization section, so please double check your message and spelling before completing your order. Sterling silver and Copper naturally tarnishes especially in humid climates. Regularly cleaning your piece with the polishing pad included with your order will remove the tarnish. Never use a liquid cleaner on your hand stamped jewelry pieces!! It will remove the oxidization within the letters! Instead use the polishing pad included with your order or a silver polishing cloth available at your local jewelers!! Items will be shipped to the address on your Etsy invoice. Please double check to make sure the address is correct and that your accounts are up to date. If you need to ship to another address, please update the shipping address in your account. DO NOT LEAVE A DIFFERENT ADDRESS IN THE NOTES BOX!!! IT WILL NOT BE SEEN BY OUR SHIPPING DEPARTMENT!! All hand stamped custom orders will ship within 3-5 business days of receiving payment. During the holidays, custom orders may take 2-3 weeks before shipped. I try my best to ship orders as soon as possible. International Orders - All International orders are shipped via USPS Priority or Express shipping. The customer is responsible for any customs charges or duty fees that their country may charge. All Items are shipped packaged in a Charitable Creations Logo jewelry box ready for gift giving. I love custom orders! If you are looking for something special that you do not see in my shop, please feel free to contact me via etsy convo and I will be happy to work with you! No, because of the handmade and hand stamped nature of our products, we do not offer proofs. 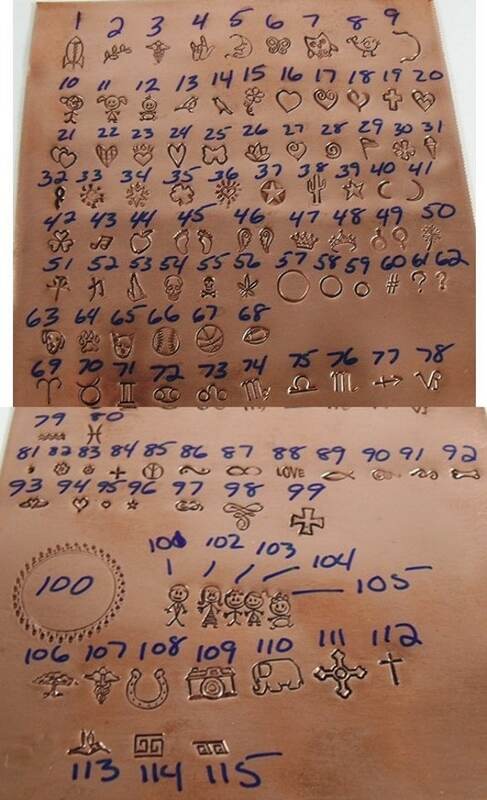 A digital proof is not accurate because the hand stamping makes everything unique.